Nothing is more impressive than a man who knows his way around a kitchen – except one who also dishes out lobster as the meal of choice. That guy is a beast.. and the best part is that guy can be you. Lobster tends to make people crabby in the kitchen, but it doesn’t have to be that way. These simple steps can help you cook the perfect carapace, and impress any girl you’re cooking for. First and foremost, if this is your first date, don’t have her over to your place yet. She’s still getting to know you — take her out a few times before you actually have her over for dinner. You don’t want to be creepy. So unless she’s one of those girls that thought Hannibal was hot, eat at a restaurant first. If you’re past date three, you’re in the clear. Here’s how to create an awesome lobster dinner. If you’re new to the kitchen or the critter, stick to tails. They’re tasty, prepared in a pinch and you don’t have to commit a crustacean killing in front of your date. If you want to be really impressive, get your lobsters directly from Maine. Maine lobsters have a whiter, sweeter meat that is more tender than those found in warm water. 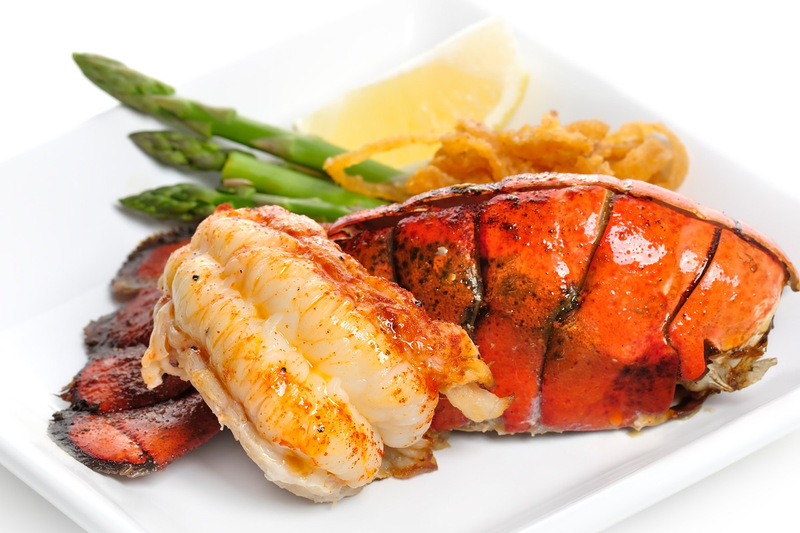 A great way to prepare lobster tails is by baking them. With a cook time of around 15 to 20 minutes and less mess to clean up, you’ll have more time to talk and enjoy each other’s company. That’s better than trying to figure out how to get the rubber band off the claws without losing a finger. All you need is a baking sheet, some butter, lemons and an oven. Make sure that if the tails were frozen, you give them 8 to 10 hours to thaw in the fridge before you cook them. Take some kitchen scissors, dig the point of the blade into the shell and cut down the back without cutting the tail fin at the end. Pull the meat out of the cut you’ve just made, and lay it onto the back of the shell. It’s kind of like a Viking blood-eagle, only the lobster already went to Valhalla. Put your tails on the baking sheet, brush some melted butter onto the meat, bake for about 15 minutes and make sure the internal temperature reaches 140°F to 145°F. Be sure not to overcook it. It will be tough and chewy — no one wants lobster bubble gum for dinner. The lobster should be a creamy-white color, with no translucent meat. Be sure if you’re not eating it immediately, you put it in ice water so it stops cooking. OK, you may not be Guy Fieri, but you did just create an excellent meal with a great date. While there may be a lot of fish in the sea, you’re the only one that took a lobster out of it and baked it for her.